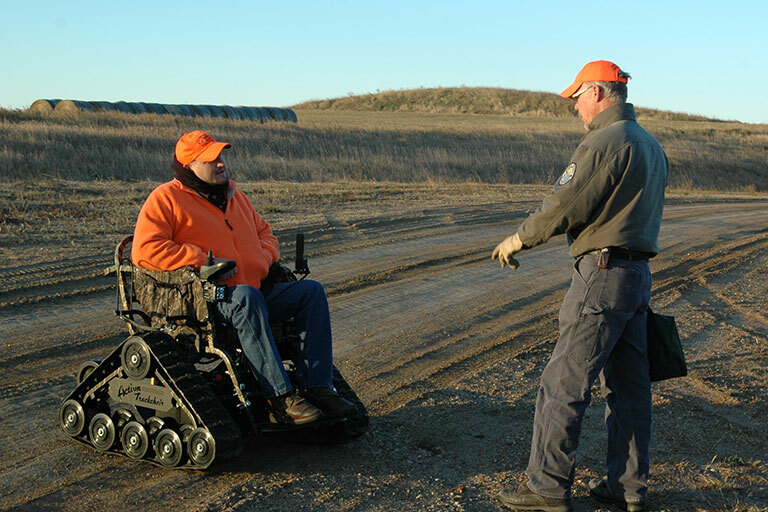 The North Dakota Game and Fish Department has a tracked wheelchair available at no charge for use at the Outdoor Wildlife Learning Center in Bismarck and at Department sponsored field events. When not in use by the Department, the wheelchair may be reserved by approved user groups for use offsite by participants of outdoor educational or hunting programs with disabilities. A waiver of liability must be signed by the wheelchair user or her/his legal guardian. For offsite use a waiver must also be signed by a legal representative of the organization responsible for the outdoor program or event at which the wheelchair is used. The tracked wheelchair may be reserved for offsite use for up to 72 hours. The tracked wheelchair must be picked up by a representative of the organization responsible for the outdoor program or event at which it is being used. The wheelchair will ride in the bed of a pickup or SUV, and loading ramps are provided. A short tutorial on how to run and load the wheelchair properly will be given upon pick up of the chair. To reserve the use of the tracked wheelchair call 701-328-6615. This permit allows the permittee to shoot wildlife from a stationary motor vehicle on private land. A current hunting license is necessary in addition to this permit. For more information on this permit, please contact the Department at 328-6335. This permit allows the permittee to shoot nongame fish or hunt game using a crossbow in lieu of a compound, long, or recurve bow. A current fishing and/or hunting license is necessary in addition to the special crossbow permit. Permittees must be either blind, paraplegic or have lost the use of one or both arms. A physician's affidavit of confirmation is required. Riverdale WMA Shooting Range (two miles southwest of Riverdale): parking and one accessible bench on the 100 yard range. Little Heart (Schmidt) Bottoms Shooting Range (12 miles south of Mandan off ND Highway 1806): parking and three accessible benches, one at each range (pistol, 100 and 200 yard). MacLean Bottoms Shooting Range (two miles south of ND Highway 1804, approximately 15 miles southeast of Bismarck): parking and three accessible benches, one at each range (pistol, 100 and 200 yard). Lewis and Clark WMA Shooting Range (six miles southwest of Williston): parking and three accessible benches, one at each range (pistol, 100 and 200 yard).